“As a progressive and forward thinking organisation looking at a renewable future, Star is delighted to support the Carbon and Energy category and wish all the nominees the best of luck”. One of Scotland’s biggest names in engineering is to sponsor the Centre for Engineering Education and Development (CeeD) Awards 2019, which is taking place on February 28th at Glasgow Hilton Hotel. As energy efficiency champions, Star Refrigeration are suitably sponsoring the award category of Low Carbon & Energy. Presented by well-known Scottish broadcaster Sheeren Nanjiani, the high profile Awards Dinner in Glasgow is set to attract an audience over 450 people including the best established businesses in Scotland and rising stars in the engineering and manufacturing sector. Dave Pearson, Director of Star Refrigeration’s renewable heating and cooling business, Star Renewable Energy, and Chair of the Board at CeeD said, “Star welcome the CeeD Awards and everything they represent in businesses, striving for better knowledge by sharing with their peers. 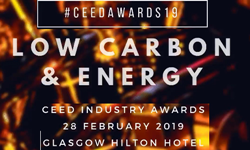 As a progressive and forward thinking organisation looking at a renewable future, Star is delighted to support the Carbon and Energy category and wish all the nominees the best of luck”. He is also inviting attendees to enter the “Wee Pledge”, a unique initiative which encourages business leaders and industry peers to donate time to the community. The raffle-style pledge will encourage each table on the night to decide how much time they can give to a good cause related to community or education. From volunteering at a soup kitchen to sharing knowledge at a free engineering talk in a local school, the cause can be chosen by each table. The highest pledge of time given to a local organisation or worthy cause will win an incredible prize provided by The Start-up Drinks Lab. The Craft Soda School is a unique day-long team experience which will be awarded to the table of 10 pledging the most volunteered time. The group develops their very own recipe of soda and designs the branding for 200 bottles of craft beverage which is completely one of a kind. The Craft Soda School experience is worth over £1,500 and is a fantastic teambuilding opportunity.